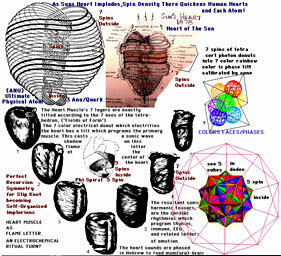 Laurence Edwards "Vortex of Life" projective geometry (beautiful graphics and article link above) has long been the cornerstone of our understanding of the spiralic electrical space in the heart. How doess the charge you check for with a spark to your tongue to see if your egg is fresh, get stored? Spin density = charge density = vortex density = projective geometry of compression = AWARENESS DENSITY. (add spin symmetry axis to cube by phi ratio - you get dodec - 4D - added spin density by recurring.. Here we could express the idea more clearly be depicting the notion of implosion, generated electrically by the heart turning inside out with compassion. (on PHIre).. The book goes on to describe the nature of the big bang as a continuous emergence from implosion, with COMPRESSION being the original sorting impulse, and the EXPLOSION being result more than cause. Here I would add- it would be more accurate and precise to say that failure to embed (ground /get in phase synchrony .. etc.) - is the cause of depletion, because it is lack of fractality that causes wave coherence to bleed. Even as re-arranging events in historical time so that they embed better on a Golden Spiral temporally (book:"Spiral Calendar" /Carolan) - is what makes time itself inhabitable and stops 'Angels' (timelord / Solarian) from bleeding. I would add to this that the presence of a pilot into the lead of the V vortex into compression, requires the skill to know the TURNS of ANGLE to allow spin (you and me) into the SYMMETRY of compression. These shadows of the self organizing spiral of perfect embedding/recursion on the donut 7 color moebius are called the Hebrew and Angle-ish alphabet - in order to permit spin to compress in the synapse in the brain. So wishes become matter - because charge compressed is what we call matter. It is the knowing of the turns of mind, which provide leadership into the V vortex of compression. As the sun prepares to compress the Earth between now and 2012 (rapture), we need the leadership of the solar shaman, who know the non-destructive path into solar phire. This pure principle of successful compression is the heart of matter, and psyche, and love and universe making activities in general. The symmetry operations among waves in a compressible medium (ether) to acheive successful compression, was more than Einstein's dilemna of how black holes could bend time. It was the actual coeur (heart of the matter in principle) to allow our electrical psyche to bend waves into the point which allows mind (recursion implosion) to steer them. The ALPHABETIC elements of symmetry allows these donuts of spin to converge non-destructively in the heart. We call the shadows of this 'yellow brick road' Spiral on the donut ....the language of the Heart. (HOW TO ALLOW CHARGE TO COMPRESS NON_DESTRUCTIVELY IN THE OPTICAL HOLOGRAM IN YOUR BRAIN).. Literally - the quantum mechanics of creation in general IS NOTHING MORE THAN THE SYMMETRY INDEX TO SUSTAINABLE "DONUT KISS ANGLES". This "flame letter" LANGUAGE OF LIGHT in the 7 spin tetra shadows 'incubeating' to separate became Hiburu. The Hypercubic (Dodec) superset became Ophanic/Enochian/Adawi, and it was the implosive glyph superluminal cookiecutter template for STARGATE (used in the movie). ../heartsun/HeartofSun.html - 'where many paths and errands meet - only the SHAREABLE survive'. relaxation of the heart are coordinated. " This confirms my alphabet of symmetry of the heart ... idea. Dynamics of Electrochemical Waves and Cardiac Arrhythmias'. This work discussed the breakdown of rhythmic biological timekeeping, discovering clues about timelessness in a wide variety of circumstances but mainly in fibrillating hearts and rotating waves of chemical excitation, i.e. the B-Z reaction referred to earlier. In the wide diversity of contexts, the same paradoxical entity occurs "... It's a motionless, timeless organising centre called a phase singularity. This is a place where an otherwise pervasive rhythm fades into ambiguity - like the South Pole, where the 24 time zones converge and the Sun merely circles along the horizon." The heart resembles an engine with many inbuilt counterbalancing electrical governing systems.... (dw note: then about fibrillation and or loss of rhythmn -- "failure to embed"?????) The other approach focused not so much on the initiation of the waves, but on the way they are conducted geographically through the heart, and the Harvard - MIT researchers, such as Professor Ary Goldberger, were the main proponents of this tradition. They found that abnormalities in the wave, spinning in tight circles, could cause 're-entry', in which some areas begin a new beat too soon, preventing the heart from pausing for the quiet interval necessary to maintain coordinated pumping. Both groups stressed the methods of nonlinear dynamics to show that a small change in one parameter - perhaps a change in timing or electrical conductivity - could push an otherwise healthy system across a bifurcation point into a new behaviour pattern. Dr. Winfree believed that both the ectopic beat and the reentry schools were on the right track despite their different focus; and that his topological approach suggested both approaches were in effect the same. " So what does all this mean? It simply provides the academic support for the preliminary data we have gathered with heart and brain frequency signatures. When the space between harmonics becomes a multiple of the Golden Mean (my 2nd order fft septrum idea measures this), THEN THE COMPRESSION WAVE WHICH IS SHAREABILITY IN ESSENCE is triggered to succeed and become self sustaining /self organizing / self aware. This solves the problem of how to teach any wave system to become self aware/steering as a worm. It is the key to life itself. (el in the eye of phi). The implications for origin of language solve the problem of e=mc^2. In that the speed of light cannot remain going in a circle, unless the spin path in to the center of that circle is perfectly recursive/embedable. (In a widening gyre no other center can hold.) This is why the light domain cookie cutters true alphabet of light, are so essential to our survival and psychokinesis. Light Cones From the Heart: The Geometry of the Emerald Modem. "sharing" and "co-operation" in the macro. P.S. I can't wait for the paradigm shift. Hint to Penrose / Hameroff: "WE WILL CLEARLY KNOW THE NATURE OF THE GEOMETRY AND PHYSICS OF CONSCIOUSNESS JUST AS SOON AS WE KNOW HOW WAVES CAN COLLAPSE SUCCESFULLY (NON-DESTRUCTIVELY?)." Is the perfect phi recursive microtubule concentricity also the high frequency wave guide of perfect tantra and kundalini? Stuart Roy Hameroff and Roger Penrose, are prime movers in the microtubules and worms within worms model of the physics of consciousness on this planet. Notice in these quotes below from them how SIMILAR in each case HOW THE WAVE COLLAPSE FUNCTION is the turning point in modeling how worms get inside worms, microtubules get self referential and self aware, and consciousness gets geometry. In other words, WE WILL CLEARLY KNOW THE NATURE OF THE GEOMETRY AND PHYSICS OF CONSCIOUSNESS JUST AS SOON AS WE KNOW HOW WAVES CAN COLLAPSE SUCCESFULLY (NON-DESTRUCTIVELY?). .. This is a good place to meet, if you are a wave.... best way to share space. How similar is all this to Einstein stuck on the problem of how to understand black holes bending time, BECAUSE HE COULD NOT MODEL A GEOMETRY WITHIN WHICH INFINITE COLLAPSE WAS POSSIBLE! Yet mother nature has already simply answered their query, they just stubbornly refuse to look. (Phylotaxes). Perfect branching, and infinite compression (fractal) is solved by GOLDEN RATIO. So waves can collapse toward their own center infinitely without destruction of inertia only in heterodyning based on PHI. We find this in the emission lines of hydrogen, in the very nature of what wave geometries stabilize gravity (dodeca nesting), and in the spectra of the ekg at the moment of bliss. The only place we DO NOT FIND, GOLDEN RATIO as the predictor of the perfect way to collapse waves, IS IN THE STUBBORN REFUSAL OF PEOPLE LIKE Hameroff and Penrose to look at the solution. This is how self awareness happens inside microtubules, which Michael Heleus tells me have already been discovered to layer their pipes in Golden Ratio multiples. This is how spark gaps in the synapse get spin dense and radiant. ../compression , & ../fire . an ocean on this planet. See "The Nature of Surf"
And note here FRACTALITY OR PERFECT SCALEABILITY is the same as scale invariance, (../scaleinvariant a PHI solution ) which as perfect data compression, is the same issue: WHAT IS THE PERFECT WAY TO COLLAPSE WITHIN!? Ask yourself in what geometry can oscillators be superposed repeatedly recursively, if not in Phi ratio braiding. (see ../superDNA ). Again Hameroff's question has an obvious answer, he just chooses not to see. I only send this tweak note that if we rattle enough cages, we may get a planet where enough people see in their minds, what indeed needs to happen in their hearts, we may get action... Like Hearts embedding into ONE! The geometry of recursion specifically among waves, both positions the wave INERTIA (by implosion) which we call and define MASS... AND creates the self organization/self embedding principle among waves we call CONSCIOUSNESS. We can see now why physicists, unable to grapple with this notion that self embedding (lo-phi) IS the creation mechanic, settle for the still mirror like idea that consciousness CREATES mass. So while admitting that consciousness CREATES REALITY specifically by inducing the wave collapse, reference below (which IS PHIcycle recursion), thay cannot grok that wave geometry can be fabricated to specifically create self organizing conscious wave systems. EXAMPLE: by repairing the geomantically damaged specifically PHI dodeca long wave grid lines of EARTH her then more recurrent field effect would stabilize gravity, atmosphere retention, and the self regulation we call GAIA. By admitting that recursion as consciousness fabricates REALITY, they in fact admit self embedding makes RE all ness. RE is Latin for THINGness, or to REcur. Thingness happens when waves become self similar inside out. note to John S. who requested anonymity but demanded: "And physicists DO NOT believe thought or thought processes of any type create or cause reality. Q: Who are the scientists who think consciousness CREATES mass? NOTE: Quantum science only works in certain narrow mathmatical frameworks.... it is not and does not operate in the real world...."
"reality is created" .... (2) when the observer (BY OBSERVING?) "collapses the wave function." "
In some ways, Nick has been in it so long, that he may indeed speak for many of the new physics folks?? Indeed the same activity of focal aligning (one inside the other) of phase fronts that we call seeing, may indeed by THE SAME WAVE FUNCTION which STORED the inertia in the wave pattern we call MAKING MASS?? they were found but they are not the smallest, and so it goes with concepts. which may enrich consciousness modeling more than thru a keyhole collapsed intentionality..
the feeling of implosion in spine juice/kundalini is NOT a simplification..
What does the statement align or surrender to the will of God mean? Jesus said; "aligned with the One are the compassionate, upon them shall be compassion." I am suggesting that the will of God is manifested as relationships to PHI. olive, so love permeates every part of Creation." the ultimate; the ultimate is bliss. without joy. Joy means exhilaration, an expression of the ultimate Bliss. but a tomb when closed". then open it. But open it to what and what is the KEY? Yoga Tradition by M. Govindan, M.A. includes man but in the fractal nature of atomic structure. it if anything beyond this limitation. It states that we are made in His image and likeness. the One (God) are the compassionate, upon them shall be compassion." from the heart, feels like. and entrains to the Will of God and you are with bliss in Unity awareness.